Apple has proposed nine new emoji to the Unicode consortium for inclusion in the standard set of images. If accepted, they will appear Emoji 12.0, which is scheduled for release early in 2019. In itself, that’s not a big deal, but Apple’s focus here is laudable. All nine emoji are aimed at better representation for people with disabilities. Apple makes its intentions clear in its proposal letter to the Unicode Consortium. "One in seven people around the world has some form of disability, whether that be a physical disability involving vision, hearing, or loss of physical motor skills, or a more hidden, invisible disability. The current selection of emoji provides a wide array of representations of people, activities, and objects meaningful to the general public, but very few speak to the life experiences of those with disabilities." You can see sample images of all nine emoji above, though different manufacturers are able to interpret the standard emoji with their own artistic style. The proposed emoji will have male and female versions where appropriate, and support skin tones where appropriate. All told, we’re looking at 13 emoji with male/female variants counts, or 45 with those variations plus skin tones. These may not be the only emoji in the Emoji 12.0 standard to represent disabilities. 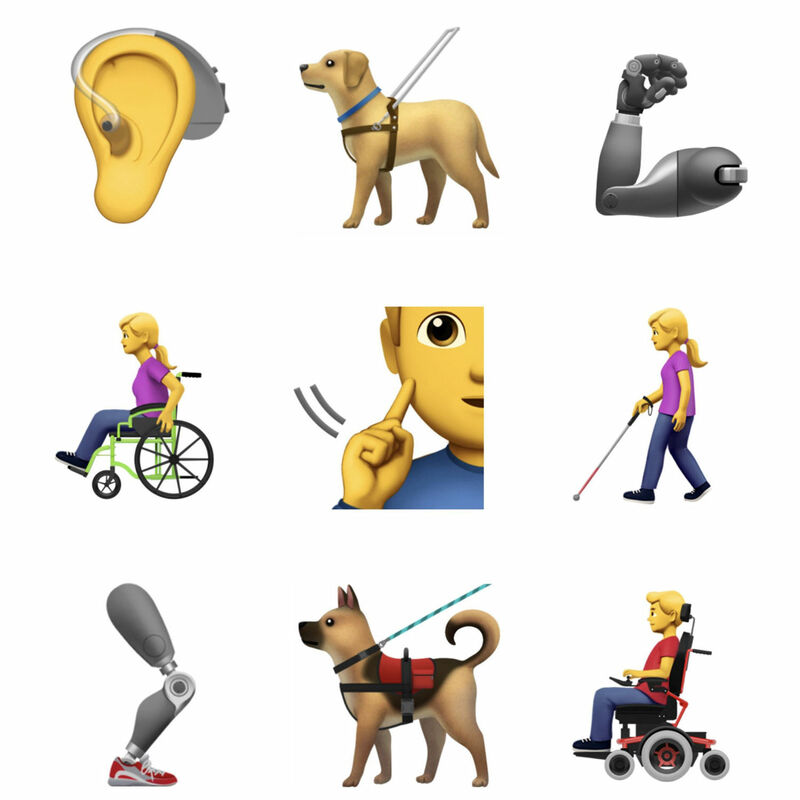 Apple’s letter states that, “This is not meant to be a comprehensive list of all possible depictions of disabilities, but to provide an initial starting point for greater representation for diversity within the emoji universe.” It is possible that others may be proposed and adopted before the standard set is finalised next year.